8 p.m.: The Easter Eucharist (Holy Communion 2), Holy Trinity Church, Rathkeale. 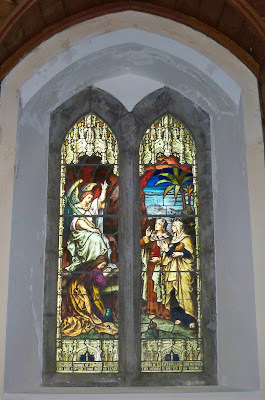 10 p.m.: The Easter Eucharist (Holy Communion 2), Castletown Church, Kilcornan. 9.30 a.m.: The Eucharist (Holy Communion 2), Castletown Church (with the Revd Joe Hardy). 11.30 a.m.: Morning Prayer, Holy Trinity Church, Rathkeale (with the Revd Joe Hardy). Readings: Acts 4: 32-35; Psalm 133; I John 1: 1 to 2: 2; John 20: 19-31. Because 25 March was Palm Sunday, the Feast of the Annunciation has been transferred in the Church Calendar to the week after Easter Week. The Feast of the Annunciation will be marked with a celebration of the Eucharist at 11 a.m. on Wednesday 11 April in Saint Mary’s Church, Askeaton. 11.30 a.m.: The Parish Eucharist (Holy Communion 2), Saint Brendan’s Church, Kilnaughtin, Tarbert, followed by the Kilnaughtin Easter Vestry. Hymns: 288; 338; 264 (Askeaton) / 415 (Kilnaughtin). 11.30 a.m.: The Parish Eucharist (Holy Communion 2), Holy Trinity Church, Rathkeale. Readings: Acts 4: 5-12; Psalm 23; I John 3: 16-24; John 10: 11-18. 11 a.m.: The Parish Eucharist (Holy Communion 2), Saint Mary’s Church, Askeaton. Readings: Acts 8: 26-40; Psalm 22: 25-31; I John 4: 7-21; John 15: 1-18. Today is the last day in Lent. There are no Liturgical Provisions in the Book of Common Prayer of the Church of Ireland. There is no collect of the day. There is no celebration of the Eucharist. The altar has been stripped bare. There is nothing to celebrate. Later this evening, I am celebrating the first Eucharist of Easter in Holy Trinity Church, Rathkeale (8 p.m.) and in Castletown Church, Co Limerick (10 p.m.). 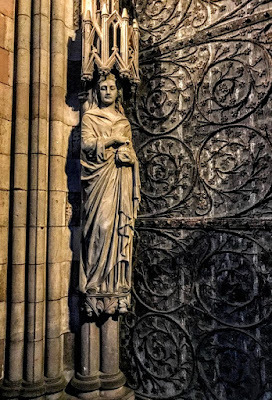 Throughout Lent, my meditations each morning have been guided by three sets of Stations of the Cross that I have found either inspiring or unusual. These are the stations in Saint Mel’s Cathedral, Longford, at Saint John’s Well on a mountainside near Millstreet, Co Cork, and in the Chapel of Saint John’s Hospital, Lichfield. For these final two weeks in Lent, I have been looking at the 14 Stations of the Cross in the Chapel of Saint John’s Hospital, Lichfield. 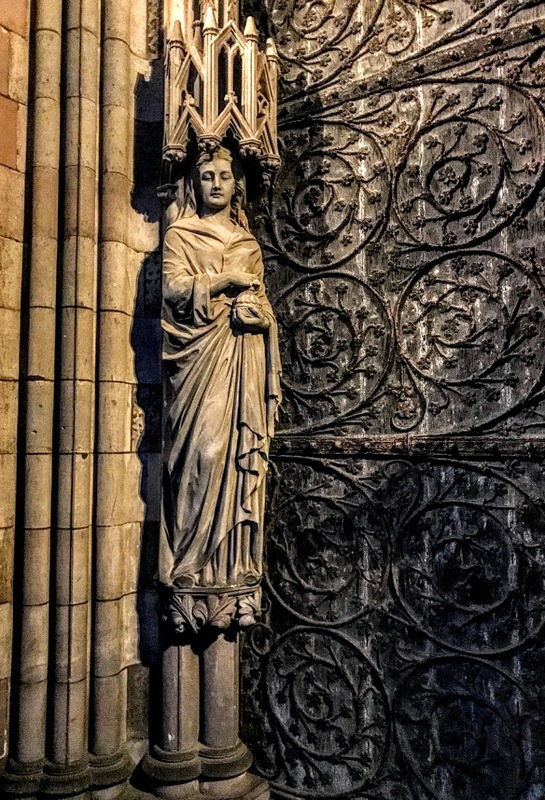 Since I was a 19-year-old, I have regarded this chapel as my spiritual home. In this station, Nicodemus who came to see Christ under the cover of darkness, now prepares to bury his body before darkness falls. 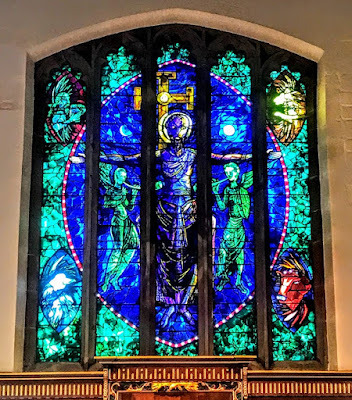 At the end of my meditations and prayers at the Stations of the Cross, I invite you to turn to John Piper’s East Window, above the Altar in the Chapel in Saint John’s Hospital. Christ is stretched out in the shape of the Cross, still wrapped in his grave clothes, his hands and feet still pierced with the marks of the nails. But this is the Risen Christ. 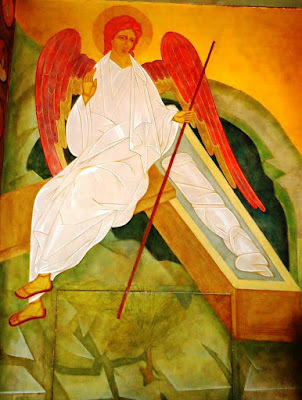 His eyes are open, and on either side are the angels who announce the Resurrection on Easter morning. Behind Christ, the Cross is empty. This Cross is in the shape of Saint Chad’s Cross on the coat-of-arms of the Diocese of Lichfield. Between Christ’s arms and the arms of the Cross, we can see the waning moon on the left and the rising sun on the right. Christ is the Alpha and Omega, the beginning and the end. 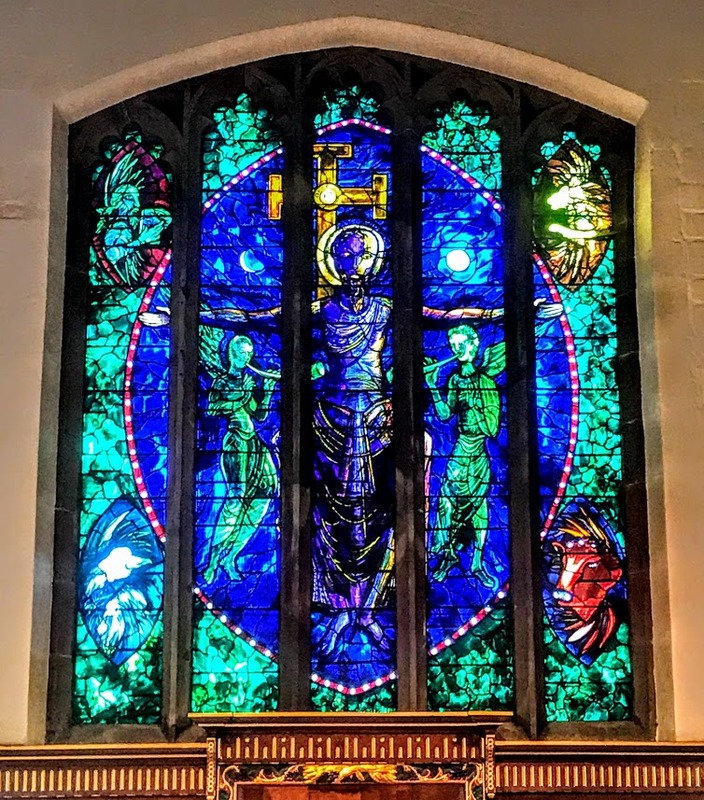 In the four corners of the window we see the symbols of the Four Evangelists: we have Good News to proclaim. Later this evening, I am celebrating the first Eucharist of Easter in Holy Trinity Church, Rathkeale (8 p.m.) and in Castletown Church, Co Limerick (10 p.m.). Tomorrow morning, I preside and preach at the Easter Eucharist in Saint Mary’s Church, Askeaton, Co Limerick (9.30 a.m.) and in Saint Brendan’s Church, Tarbert, Co Limerick (11.30 a.m.).